The Route is the first commercial application of a range-extended electric refuse truck. Wrightspeed and The Ratto Group unveiled The Route, the first commercial application of a range-extended electric refuse truck, at a press conference in Sonoma County, Calif., yesterday. With The Route and backing of the Sonoma County Board of Supervisors, communities throughout Sonoma County and neighboring counties will be serviced by a clean and quiet fleet of trucks. The Route, which has been recognized by the State of California for its ability to help meet progressive climate and air-quality mandates, is designed to deliver economic, environmental and performance benefits in both OEM-installed new vehicles and existing fleet retrofits. “As an early adopter of our powertrain technology, Lou Ratto has solidified Sonoma County as a leader in pioneering new technologies that will improve and preserve the region for future generations,” said Wrightspeed Founder and CEO Ian Wright in a press release. “We’re proud to collaborate with Lou and his team and to establish our powertrain technology as the economical and environmental choice for cleaner, quieter and more efficient communities. 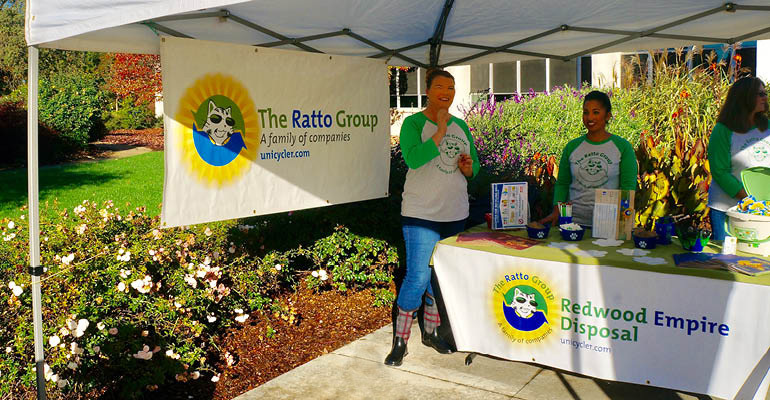 Currently, Ratto’s fleet of refuse, recycling and compostable yard waste trucks services more than 140,000 customers throughout Sonoma County, Mariposa County, the City of Novato and West Marlin. And to meet community needs, Ratto and Wrightspeed are rolling out more than 15 Route trucks over the next 12 months. Additionally, Wrightspeed was awarded $7 million in grants by the California Energy Commission to further develop technology for broad-based adaption of The Route.